Grubs are one of the worst problems you can have in your lawn. Why? Well, because grub problems can spread rapidly and before you have time to deal with them it’s too late. In fact, it’s not always the grubs themselves that cause the most problems. Often, it is the animals that dig in the yard to eat the grubs that can wreak the most havoc. The reason that animals can cause this type of damage in the first place is that the grubs eat the roots of the grass. Once the roots are eaten the turf is easy to peel back, so the animals peel it back at night and feed on the grubs. If your lawn is looking thick and healthy and you don’t have bare or brown spots, you most likely don’t have a grub problem. If you do have brown spots, or if your lawn has been dug up by animals it is very easy to see if you have grubs. Just kneel down and try to peel back some of the turf. If it comes up very easy like a carpet that has not been stapled to the floor, then you most likely have grubs. How do I get rid of grubs? If you have a grub problem it is best to call a lawn care company. Any reputable lawn company should be able to deal with your grub issue. 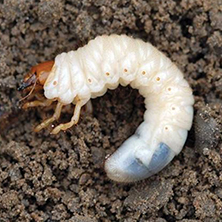 The best time to treat for grubs is in May/June. If for some reason you do not realize you have a problem in the spring, the second best time to treat for them is in the fall. Not sure? Just call your local lawn care provider as they specialize in dealing with this problem. Need a hand with lawn care? Get a free quote from Dr. Green today.